Does an off-axis aperture equal an Apo of same size? You guys must know this: You take your reflector with a big mirror made by (insert favorite optician) and you limit it's aperture by a 4" or 5" off-axis cardboard cut-out placed over the front tube to gain an unobstructed view without the secondary in the way. 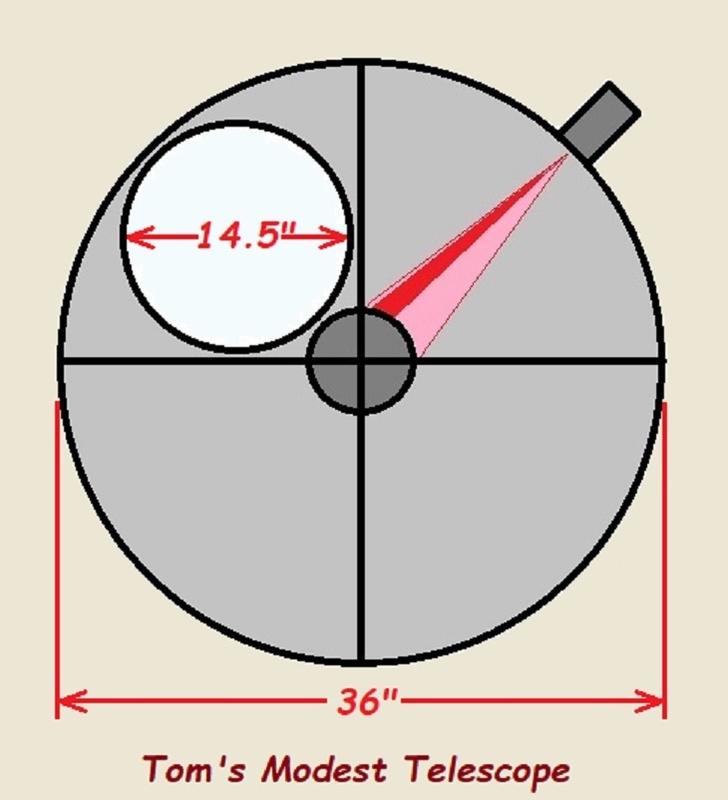 Does this off-axis aperture (premium mirror) equal same-size Takahashi refractor? Meaning is it as sharp? Refractor-like? Same contrast? If not, why not? I mean premium mirror + off-axis should equal an apo of the highest quality, right? I've tried masking my 18" Obsession to 4" off-axis a few times, but my Stellarvue 4" Apo does a better job. Might be the mirror was not cooled down all the way, or collimation very slightly off, but I think Apo's just rule at small apertures. When I first got my 18" I made a 6.5" off-axis aperture mask to look at Jupiter. It looked really nice, then I used it at full aperture and it looked amazing. It can be very close. Once had a 13" Coulter Dob. It had noticeable astigmatism at 200x. I put a 5" aperture stop on it. No astigmatism visible. It ran pretty dead even with the excellent 6" Quantum Maksutov I compared it to on Jupiter. 6" obstructed = 5" unobstructed was my conclusion. Once owned a 5.5" DGM off axis Dob. These off axis mirrors were biscuit cut from larger parent mirrors. The mirror was actually 5.2" clear aperture. Gorgeous airy disks on stars with a faint diffraction ring. Could not have asked for better - definitely APO like. Refractor owners don't like hearing this news. I don't feel sorry for them - because I own/love refractors myself. But who would be the winner between my 4" Tak APO and a 6" f/8 Newt? The Newt wins. Doesn't mean I'm putting the Tak up for sale because a simple Newtonian can show more planetary detail. Want a scope that you can set down beside anyone's 6" $10,000 APO? Build yourself an optimized 8" f/8 Newt. Rules of optics, not my rules. Edited by TOMDEY, 15 April 2019 - 11:05 PM. 1) are the optics the same quality on the wavefront? I note that a 1/4 wave error on the surface of the mirror makes a 1/2 wave error on the wavefront. (And there are 2 mirrors.) But a 1/4 wave surface error makes only a 1/12 wave error on the refractor wavefront for one surface. But obviously it will have 4 or 6 surfaces. Or an oiled lens might have 2 surfaces -- same number as the reflector..
2) does the reflector have smooth surfaces? Argument (1) applies here too. Surface roughness will have a much larger effect on reflectors. 3) the reflector has the thick, slowly cooling mirror at the bottom of the tube / truss, which is sending warm air currents upward into the light path. And the light passes through the warm air TWICE hence doubling the wavefront errors. For the refractor, it is open above the lens so the disturbed path length is short. And the light passes once through the warm air. 4) For the reflector the hot observer is sitting / standing next to the light path. For the refractor, the hot observer is out of the way. Like the fly - don't get caught in the spider web of countless, minor details that really don't amount to much. The fact is that an off axis stop applied to a Newt with reasonably decent optics will produce an optical train that will perform essentially like an equivalent APO refractor, albeit a little less bright. Please try this for yourself. No need for theory. No need to invoke wave ratings! I've been doing this type of comparison for years. The short answer is yes it is essentially an apo. I even made a dial an aperture device where I could choose one of 4 apertures. The only real drawback is that the light path travels twice through the unprotected air and seeing can be more sensitive. In a reflector there are reflective losses and scatter. And while at first glance, it seems like the OA Newtonian would have all the virtues of an F/11 or slower scope, the mirror is an off-axis section of a very fast mirror and so the off-axis aberrations are those of a much faster scope. Not quite as fast as the original mirror but close. It is not true coma. The real issue I see is that the big mirror, if of decent quality, without the mask has far better planetary contrast and resolution than it has with the mask. The diffraction effects of the secondary are tiny in comparison to the diffraction effects of the aperture mask(and the refractor's aperture.) And too, most large aperture scopes have COs that are quite small and have essentially no effect on contrast, they are essentially unobstructed. My 25 inch F/5 has a 14% CO, that is less than 2% of the area. I have a nice TeleVue 4 inch refractor. I also have a 13.1 inch F/5.5 Starsplitter with a Royce mirror. It has a 20% CO so I could mask it down to 4 inches. But the question is why would I want to do this? The 13.1 inch F/5.5 is a far better planetary scope than the refractor, better fine scale contrast, resolution, brightness.. Masked or unmasked, the set up effort is the same, the thermal issues are similar though some tube currents may be avoided by proper orientation of the mask. As a planetary scope, the virtues of an apo are quick setup, thermal stability, high transmission, lack of scatter. They do have higher fine scale contrast when compared to a scope of equal aperture but when compared to a scope that is 2x to 3x the aperture, particularly a scope with a small CO, the the APO is at a significant disadvantage in terms of contrast transfer and resolution.. I think if one does not have an APO for comparison purposes and one wants to see what all the hoppla is about it makes sense. Or if the seeing is substandard so that the smaller scope will perform better. In my experience comparing 4 and 5 inch APO/EDs with large Dobs, if the seeing limits the large scope, it will limit the small scope, neither will provide decent planetary performance. Not 100%. APO still would still win on contrast inch for inch. My experience with off-axis masks, is that the un-masked view is generally preferable, unless the scope has some optical or thermal problem. For example, when my 18" has bad thermal problems and tube currents, I can put a 7" mask on the bottom of the aperture and that will eliminate much of the tube current, and give a sharper view of Jupiter. Or when my 24" was having trouble with bad seeing on Venus or Saturn, a 9" or 10" mask gave a slightly sharper view. But the problems have to be pretty bad for the masked view to be preferred. It's a different question from one posed by the OP, but once you have a larger reflector, you probably won't want to mask it down. I have not done a detailed side-by-side comparison of say a 4" APO vs an 10" stopped down to 4", etc. Would be interesting to try I suppose. Study under which conditions the APO is preferred, etc. My "guess" is that the 4" APO will win when conditions are really bad -- warm optics and rapidly falling temperatures and the like. And the rest of the time you'll just use the 10" at full aperture. Theres also convenience, weight, thermal mass, cool down times, etc. The 4" APO is going to be easier to manage, and cool faster, than say a 10"+ inch Newtonian. That needs to be figured in also. Would the same logic apply to masking off an SCT? I have a Meade 10" SCT. This might be a fun project. Several years ago, I did a side-by-side comparo: a 4" off axis mask with a 16" f4.5 truss Dob (with a decent, but not exceptional figure), an Orion ED100 , and a DGM OA-4 (98mm actual). The off-axis mask worked well and created the impression of a sharper image when compared to the full aperture. This was aesthetic, but it did not match or surpass the performance of the refractor or the dedicated off-axis Newt for actual detail observed on Jupiter. Nor did it produce the little "cue-ball" double star Airy disks seen in the refractor and OA-4, courtesy of thermal issues (boundary and body heat- a big deal for large scopes, as others have mentioned above). However, at full aperture, even with it's 'softer' image, the full aperture 16" smoked the smaller apertures. As Jon mentioned, if you don't have a dedicated small aperture, then off-axis masking can be informative and aesthetic. But it's unlikely to outperform the full aperture or match a decent ED or Apo. Another note: In other threads on the topic, it's often pointed out that in order to get the off-axis mask to perform to it's potential, the secondary mirror should be realigned to point to the center of the off-axis aperture. Then, the focuser should be tilted to maintain the 90deg angle to this new, tilted axis. I have no idea to what extent this impacts performance, and I didn't do this with my masks. However, these features are built in to the OA-4, so it's reasonable, I think, to assume it's fairly important. EDIT: Added "match" after "This was aesthetic..."
Edited by KerryR, 16 April 2019 - 11:31 AM. Yes it will also work for an SCT. For a 10" you probably want a 3" hole in the mask, since the secondary mirror is pretty big (34% CO?). I bought an Orion 3.6 OA reflector years ago just as an evaluation tool to get an idea of what an 85 to 100mm scope could show. I liked it so much that I'm rebuilding it now, reducing its weight from 12lbs to 4lbs. Love the views, as good as a Tak? I don't know but I haven't used or bought one or any other APO either! Yes, you can use an off-axis mask, with all the same caveats mentioned above (minus, of course, the bit about re-aligning the secondary). If/when you try this, orient the hole in the mask at the 6 o'clock position, where it'll avoid some of the thermal impact if present; things are usually worse near the top of the tube. Edited by KerryR, 16 April 2019 - 11:44 AM. This raises an interesting question. I'll use TOMDEY's scope for this question, since he posted a dimensioned photo of it... What if, rather than making a 14-1/2" off-axis mask, TOMDEY made a 6" off-axis mask, with the 6" aperture as close to the center of the mask as possible while still not having the spider vanes visible in the 6" aperture? Would that place the light path close enough to the center of the mirror that the off-axis aberrations would be reduced to invisibility? A different path that while you did not ask about, may be something to consider. The seeing that generally is the driver behind these kinds of attempts to improve planetary performance (and remembering that diffraction of the aperture is the single hardest limit to a telescope's ultimate performance, with a smaller aperture having a handicap to a larger aperture from the standpoint of maximum contrast transfer) and while an aperture mask is one way of dealing with seeing, another approach is an apodizing mask. The biggest benefit of the apodizing mask will be seen on double stars, but planetary views can also benefit. And this. Why ask the question? Cardboard is cheap and finding a suitable size circle to mark your aperture should be easy. My advice? Try it and see if you like it. The apodizing mask is harder to make, but having used both, my own belief is that of the two approaches the apodizing mask might be the better way to go. While an apodizing mask is a bit harder to construct, it is by no means difficult and can be made for less than $15. And finally this. A 5" Apo, or even a 6" Apo is no match for a good 12" mirror on nights where seeing is better than about 2 arc seconds. Using a masked down telescope or apodizing mask will perhaps give you good views of planets on night of poor seeing, but you will never ever ever see as much detail on planets as you will with even a decent 12" mirror on nights of pretty good seeing, and often on nights of so-so seeing, some patience at the eyepiece of a larger scope will often yield a many moments of very good seeing, where more detail will be seen in the smaller scope during the full duration of a 2 hour session. I know this from setting up my 6" Apo next to a variety of larger scopes. Sure, the view is nice, but the hard limit of the diffraction of the aperture means that you never exceed the level of contrast that the smaller aperture will produce, while in moments of improved seeing, the much higher contrast transfer of the larger scope will almost always show more detail during those short moments where seeing can improve. And if seeing is really horrible, better to spend time looking at something other than planets. Edited by Eddgie, 16 April 2019 - 12:17 PM. ...In my experience comparing 4 and 5 inch APO/EDs with large Dobs, if the seeing limits the large scope, it will limit the small scope, neither will provide decent planetary performance. In my experience, it's not so much that the seeing limits the large scope, it's that the seeing is visible in the large scope (along with the additional detail, color, contrast, etc.). In the smaller aperture, the seeing isn't visible, which makes the available detail, color, contrast, etc. seem very stable, "locked in" for lack of a better description. Also, generally speaking, while the smaller scope may be operating at up to 50X or 60X per inch of aperture, this works out to 200X to 300X for the 4- to 5-inch range, so the image brightness takes a significant hit. With a 22-inch aperture, 300X is less than 14X per inch of aperture. With an 8mm eyepiece and Paracorr, I get 320X and the planetary images are bright and detailed! Even 430X is moderate (less than 20X per inch) magnification. I guess what I'm trying to say is that it's tough to compare a 4-inch APO to a dialed-in Newtonian that's 2- to 3 times the aperture of the smaller scope. My 22 completely overwhelms my 6-inch APO visually, but the APO is also a versatile imaging platform, and I can roll it out and start observing in a few minutes. That said, the 22 is still my favorite "grab-n-go" scope! Your views could even be better if you'd follow my advice and learn how to get your scope properly collimated.. Sorry.. but I just could not help myself.. I want to thank you for all your efforts on Cloudy Nights and elsewhere in helping amateur astronomers at all levels understand collimation.. In my experience when comparing a Newtonian to an apo refractor, if the seeing limits the larger Newtonian to the size of the refractor or smaller the refractor will win. Just as a 5-inch apo refractor will best a 5-inch Newtonian because of the refractor’s inherent contrast, throughput and definition advantages. If the seeing allows for the larger Newtonian to use a large enough portion (doesn’t have to be the total aperture) of its resolving potential to best the refractor’s optical advantages, then the Newtonian will deliver more. The apo will best a same-size, off-axis mask. But depending on the seeing, the off axis mask might make for a cleaner view with a touch less scatter compared to the full-aperture view. A scope with a mirror like a Newt or SCT will lack a tiny bit of contrast vs the APO if both scopes are well made, inch for inch. So say you have a 12.5" Newt and mask it down to 3" and do a side by side with a 3" Tak and the Tak will win out. Now unmask the bigger Newt and it will win out vs the 3" Tak on viewing planets. Why not enjoy your reflector for its strengths? I don't have a reflector. I used to...waaaay back in the early 80s. 13" Coulter Odyssey 1, and I did just what I described based on what I read on some astro mag back then. 5" off-axis mask over the Odyssey. Target: Jupiter. Result: I preferred the full aperture. The 5" unobstructed view was just too dim for me. And this was with a 9mm eyepiece (166x). I didn't see more detail and I didn't see a more aesthetically pleasing image either. I only saw a very dim Jupiter. Like looking at it thru welders glass. The Odyssey was my only scope and I got very spoiled by that 13" aperture so dropping down to 5" made everything look really, really dim. But there were no apo refractors back then. Nothing to compare it to. If I ever again acquired a large reflector, I would repeat the above experiment. By that time I should have an apo refractor too becauseI don't have that either. I tried this several times with different reflectors. I had a 5" mask on my 12.5" Dob, which I used frequently. Objects were sharper and I could split doubles that I could never split using the full aperture. On the down side, the image looked dim compared to a refactor of equal size. I guess mirrors do not reflect as much light as what a lens gathers; or at least, that's how it worked out in my experiments. When using a 2" mask on a 6" F8.3, I was able to split Epsilon Bootes. This was really an 2" F33 and my main memory of using it was that I could move the focuser back and forth about an amazing distance (seemed like a 1/4") and everything was still in focus. With respect to apochromats, they are not going to be significantly brighter than equal aperture achromats. More importantly, if Brightness is the criterion there was never a point in running the test. Shift the criteria to perfection of the image and contrast, and the game changes substantially. The underpinnings are covered well in Albert Ingalls Amateur Telescope Making Volume 2, and touched on in Volume 1.